Floating down the Mississippi River on three sheets of plywood had never been my life-long dream. In fact until a year ago the thought of cruising on our inland waterways had never crossed my mind – until I met a cross-country cyclist in Texas. How many years has he been cycling, I asked. “This is my first time. I like to do something different each year”, was his reply. I pressed him for details. Yes, the cyclist responded, he had ridden a HONDA SILVERWING coast-to-coast, traveled the country on freight trains – and floated down the Mississippi with his girl friend on three sheets of plywood. My ears perked up. The cyclist had started at St. Paul, MN. With the aid of a helpful marina owner they had strapped some styrofoam blocks to the underside of his plywood, got an old outboard motor – and made it all the way down to New Orleans. What an idea! The more I thought about it the more it appealed to me. It sounded like an adventure and a personal challenge. 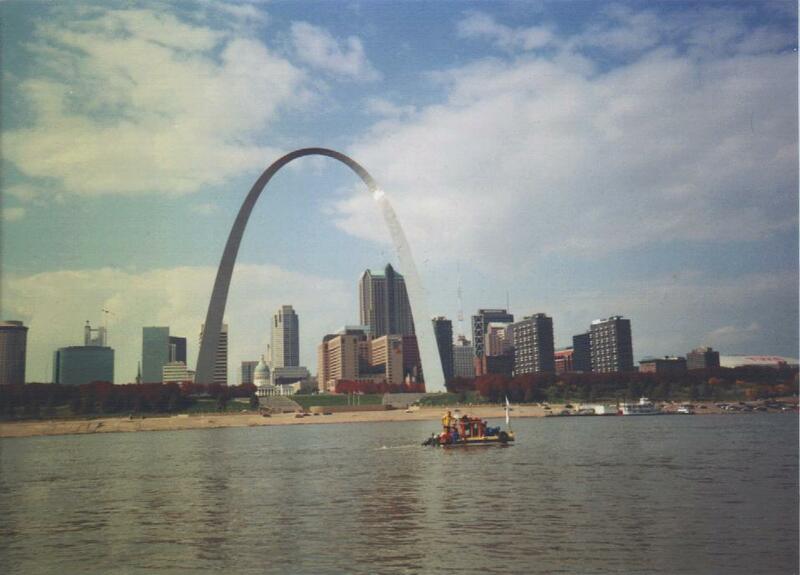 Anyone can travel down the Mississippi on a yacht, houseboat or steamer. This would require a certain amount o ingenuity. A self-constructed wooden raft has to be the most basic form of water travel. If Tom Sawyer and Huck Finn could do it – why not me? “How would you like to go down the Mississippi on three sheets of plywood?” I asked my daughter Inge half in jest. “Let’s do it, Dad!” she replied. And that seed of an idea was starting to sprout. The more I thought about the project the more I realized what a complete novice I really was. I needed answers to a lot of questions. Inge and I met on Sept. 6 in St. Paul. She rode the “Dog” [editor: That can be read as Gray Hound] from San Antonio, TX and I drove my 83 NISSAN SENTRA station wagon from Upstate New York. At Willie’s Hidden Harbor Marina we constructed our raft. Owner Willie permitted us to use his new boat ramp – not yet in use – to hammer together our “Laurens Express”. 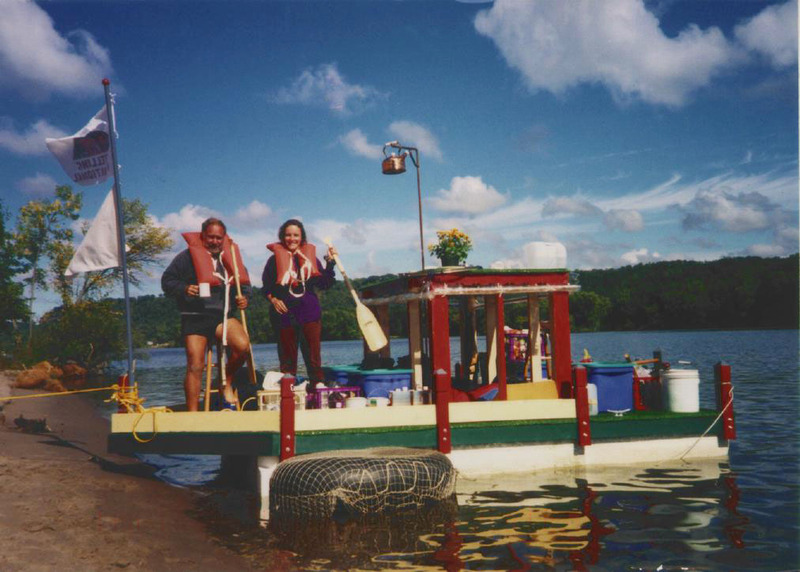 Using 2×6 and 2×4 construction lumber along with 5/8″ plywood sheeting Inge and I assembled the raft in five days. Since we planned to sleep on the raft we built a “shelter” out of 2×4’s, and plywood and plastic. I also made a rudder – much larger than needed – in order to have some control. Inge and i painted everything in bold colors. Our thought was, if we can’t be high tech at least we can be cute. And that we were. Our Laurens Express oozed with cuteness. It attracted lots of attention. We stocked the raft with $150 worth of supplies. Lots of canned goods, staples such as peanut butter, rice, coffee, sugar, potatoes, cabbage, onions, carrots and 4 2.5 gal. containers of drinking water – which we refilled at marinas. In addition we had a Coleman 2-burner stove and gas lantern plus 5 1 gal. cans of stove fuel. Two 5 gal. 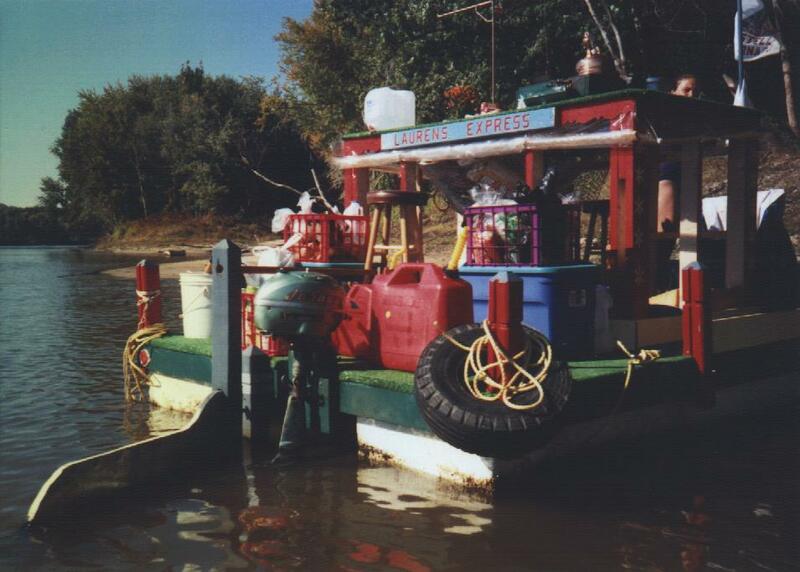 gasoline cans kept our 5 HP Johnson outboard motor running, and a small anchor prevented the raft from drifting. Many of our belongings were secured in 4 large plastic tote boxes. Two bar stools allowed us to sip upright at our “table” (a.k.a. the roof our our shelter). Inge and I used sleeping bags and Therm-O-Rest pads for our comfort. We even had a carpet (rescued from a dumpster) lining our sleeping quarters. Especially helpful was a tea kettle, 4 pt. pressure cooker, and cast iron skillet. When we finally launched our raft on Sept. 14th we made an startling discovery. Our Laurens Express was moving only infinitesimally even though we were in the main channel. It soon became apparent that the flow rate of the Upper Mississippi River is completely regulated by the locks and dams. We were forced to run our old Johnson 5HP motor constantly if we wanted to go anywhere. Besides, our rudder was totally useless if we just drifted along. A rudder only functions if the vessel is going faster or slower then the current. The Upper Mississippi is that stretch of river beginning at Cairo, IL (where the Ohio joins the Mississippi) and ends at the Upper St. Anthony Falls Lock in Minneapolis, MN at mile 853.8. Milage on the Lower Mississippi River (Gulf of Mexico to the Ohio River) are measured upstream from the Head of Passes, 95 miles below New Orleans for a total of app. 850 additional miles. It was fall along the Upper Mississippi. Inge and I enjoyed the warmth of the sun and clear days. In the early weeks of our six-week journey we would average about 25 miles per day or about 4 m.p.h. Many old river towns came our way. Names like Red Wing, Alma, Winona, La Crosse, Prairie du Chien, Dubuque, Savanna, Clinton, Davenport, Keokuk, and Quincy. Those and many more required a closer look. We would tie our raft to a municipal doc and explore. Hannibal, MO attracted our special attention. This has to be the “mecca” for all rafters – Mark Twain’s boyhood home. Three miles downstream we saw the island where Huck and his friend Jim camped. Muscatine, IA was the Pearl Button Capital of the world (in the late 1890’s). 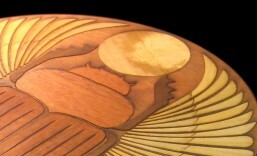 Buttons were made from river clam shells, a labor intensive operation. Even today you can find clam shells with large holes where they drilled out button blanks. Almost every day we would stop at a marina for fuel and water. Occasionally we’d use their showers. More often we used the river. A few times houseboat owners offered us the use of their boat. We never refused. Generally Inge and I would pull our raft onto an island, secure the raft, cook supper and read or listen to music. Our lantern not only provided light but also warmed up our plastic-covered shelter. As the weeks went by the weather in late October became less and less predictable. The nights turned cold. Our goal of reaching New Orleans was becoming more and more unrealistic even thought we were making better progress once the Ohio River had entered the Mississippi. memphis, TN became our new destination. We had less than 100 miles to go when our vintage 5 HP Johnson quit. No amount of repair helped. WE limped into New Madrid, MO – not certain how we would dispose of the raft and get back to St. Paul, MN where we had left our car. However Fortuna was on our side. By chance we met Fred (a former river boat captain) and his wife Margaret. 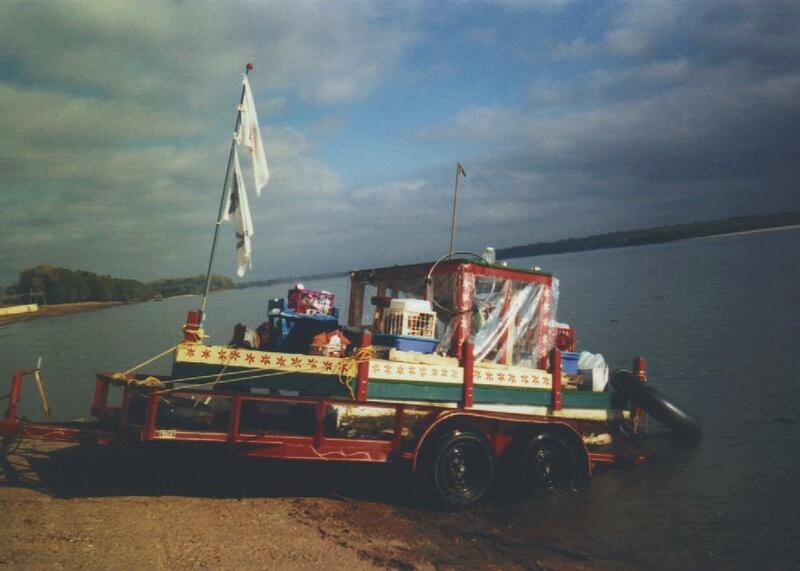 With the help of their boat trailer we lifted our raft out of the river and parked it at their home, stayed three days, had the use of their second car and were driven to a Greyhound station 25 miles away. Fred agreed to deal with the raft. Talk about helpful people! Inge and I have returned to the “real” world. Our six week adventure is but a memory – but a very pleasant one. We will never forget “Life on the Mississippi”. OK, so you want to build a raft. Here are some of the lumber items we purchased. In addition you will need an assortment of fasteners (nails, screws, truss plates, etc. ), paint, plastic sheets, staples, etc. We also covered the raft with inexpensive “astro-turf” style carpeting. The rudder was fashioned out of plywood and covered with sheet metal. It was attached to the raft using gate hinges. B-202 Clifford Davis Federal Bldg. Dow Styrofoam brand Buoyancy Billets come in three sizes.